Summer is a banner season for The R&H Concert Library, as hundreds of orchestras across the country take their music outdoors and perform in parks, bandshells and amphitheatres. The R&H Concert Library, in fact, was launched more than 40 years ago with Rodgers & Hammerstein concert scores created for performances held every summer at Lewisohn Stadium in New York, which frequently featured Richard Rodgers himself at the podium. The music of Rodgers & Hammerstein is still at the fore of our concert library. But we are also pleased to report that equally talented colleagues - from George Gershwin to Andrew Lloyd Webber - are represented as well, and that their catalogues here get bigger every year. The newest member of our library (thanks to our relationship with Warner/Chappell Music) is a classic name: George Gershwin. The R&H Concert Library now has orchestral versions of many Gershwin works for rental, including the landmark compositions RHAPSODY IN BLUE and AN AMERICAN IN PARIS. The Library also offers numerous standards from Gershwin's scores written with his brother, lyricist Ira Gershwin, including "Embraceable You," "I Got Rhythm," and "Someone to Watch Over Me." Irving Berlin has been represented by the Concert Library since 1990, but the past few months have seen an exciting expansion of his catalogue here: in addition to a number of Berlin standards featuring new arrangements by David Bishop (including "Cheek to Cheek," "Let's Face the Music and Dance," and "Say It Isn't So," which Bishop premiered with the Minnesota Orchestra), selections from Berlin's Broadway scores for MISS LIBERTY, MR. PRESIDENT and LOUISIANA PURCHASE are now available for the first time. (Materials from these scores were painstakingly restored earlier this year, based on files in the archives of the Library of Congress, and premiered at WALL TO WALL IRVING BERLIN in March; see cover story.) All of these new selections are scored for soloists and orchestra. From John Williams and Sir Andrew Lloyd Webber we can stake our claim to the best of contemporary Broadway and Hollywood. Our most recent acquisition from Williams, "Exultati Justi," is a choral work featured in the Steven Spielberg epic film EMPIRE OF THE SUN. R&H also rents suites from Williams' soundtrack scores for the STAR WARS trilogy and SUPERMAN. A prolific talent and prodigious composer, Williams - who received his 5th Academy Award this year for SCHINDLER'S LIST - recently retired from his post as Musical Director of the Boston Pops to devote his time to guest-conducting and writing new compositions. Equally busy is Sir Andrew Lloyd Webber, with five musicals running in London, three on Broadway, and countless others in production worldwide. As exclusive U.S. licensor of Lloyd Webber's "Really Useful Group" concert catalogue, The R&H Concert Library offers rental materials for his scores to JOSEPH AND THE AMAZING TECHNICOLOR DREAMCOAT, CATS, THE PHANTOM OF THE OPERA, SONG & DANCE, ASPECTS OF LOVE, STARLIGHT EXPRESS - and now, SUNSET BOULEVARD, his newest musical triumph, currently starring Glenn Close in Los Angeles, Betty Buckley in London, and due on Broadway in the fall. The tradition that started it all, the Rodgers & Hammerstein summertime pops concerts, continues to thrive. 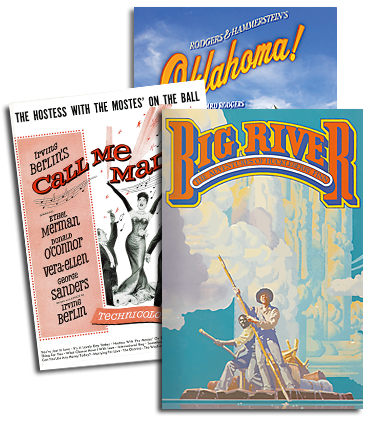 Summer '94 has the first year of the team's second half century starting off in grand style, with record requests for our Rodgers & Hammerstein concert package, and for the new orchestral OKLAHOMA! and CAROUSEL suites arranged and orchestrated by former ASCAP President Morton Gould. For further information please call The R&H Concert Library at (212) 541-6600 or (212) 564-4000.